It is the stuff of which our Island history is made. The House of Commons has voted overwhelmingly to give the Prime Minister leave to invoke Article 50 of the Lisbon Treaty, and thereby trigger the UK’s departure from the European Union. The people’s Brexit has become the Commons’ Brexit, with most MPs acknowledging the ultimate source of their sovereignty. Belligerent Remain MPs were swept aside as every blocking amendment was skewered on Theresa May’s stilettos. Brexit still means Brexit. If their Lordships are to survive, they must indeed pass this Bill cleanly; that is, without amendment. If they do not, revolution will be in the air. The Archbishop of Canterbury Justin Welby – a devout ‘peace and reconciliation‘ Remainer – has already indicated that he will vote to pass the Bill. “I accept we voted leave and I will be supporting the Brexit Bill in the House of Lords,” he told LBC‘s Nick Ferrari. He added: “I weighed it up very carefully at the time. Maybe I got it wrong, you might well be right, and If I did, I apologise.” That’s the humble Christian calibre of the man. His change of mind, or heart, or pragmatic decision to vote for Brexit is symbolically (not to say politically and spiritually) very important. The senior bishop and principal leader of the Church of England is voting for the UK to leave the EU after decades of Church complicity and collusion in communion with the Treaty of Rome. Such schism goes against everything he sincerely believes about unity, mutuality, peace and reconciliation. It is a deeply personal reformation. The Archbishop of York John Sentamu has not indicated how he will vote. Perhaps he remains convinced that he still has a “moral obligation” to vote against the Bill, if only in order that other nations would know that our word is our bond. Or does the referendum result and the will of the Commons constitute “a cogent argument for why we should be out”? He told the Times back in May that he didn’t know one. Surely the express will of the majority of voters and the resolution of their parliamentary representatives nudges towards political cogency and democratic force? There is, of course, no episcopal whip: all are free agents, bound only by their consciences before God. But should the Lord Bishops vote to frustrate the Brexit Bill, it would have the effect of withdrawing, at a stroke, the justification for them being in the House of Lords. If they’re not prepared to vote for the most important piece of legislation for 50 years, some people might argue, what is the point in having them there at all? Quite a few bishops will genuinely be unable to make some votes (overseas visits, pastoral priorities, unbreakable diocesan commitments, etc), which would be quite different from deliberate abstention. They will all now know the dates, and will be waiting to read what amendments are tabled or are pressed to a vote by Peers. It is worth remembering that highest modern turnout of bishops at a vote was in 2006, when 14 voted against Lord Joffe’s Assisted Dying Bill. That’s 14 out of 26. Of course, some might have wimped out, as they may do with the Brexit Bill (not to mention the forthcoming Great Repeal Bill). But the benefit of doubt must be given: absences are highly likely to be for genuine and legitimate reasons. But all it will take is for one bishop to vote for an amendment, or to vote against the Bill altogether, for the whole church (hierarchy) to be castigated. And Philip North, now Bishop-Elect of Sheffield, would be affirmed in his perception that bishops generally (and perhaps Lord Bishops especially) are elitist, aloof and apparently quite indifferent to the priorities and concerns of ordinary people. He exhorts his fellow bishops to “pay proper attention to the voices of those whose votes have caused this revolution, whether or not we like what we hear”. Quite so: not to do so would be great folly. 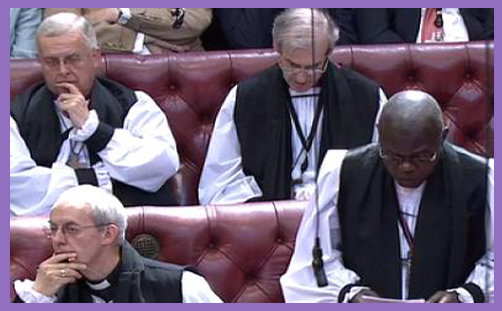 Bishops play a unique role in the House of Lords. They are the channels of supernatural grace transfused from the Apostles to the first bishops and down through the centuries of the Church. They contribute undoubted words of wisdom, warning, insight and discernment. But their existence in Parliament is not dictated by revelation or some other supernatural necessity. They are there because their sound governance of English Christianity has been found to be helpful, if not necessary, for the sound government of the United Kingdom. And their presence as a civil power is with the consent of the people, whose judgment in a democratic vote must be respected, whether or not the Lord Bishops like it.